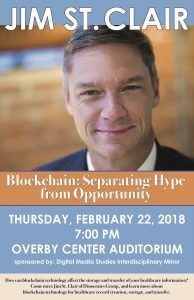 Digital Media Studies minors and others interested in technological innovation had an opportunity to learn more about blockchain during a presentation by Jim St. Clair on February 22, 2018, in the University of Mississippi’s Overby Center. St. Clair is the chief technology officer of the Dinocrates Group, a technology consulting firm, and a University of Mississippi alum who earned his bachelor’s degree in business and administration. He is also the founder of the Institute for Healthcare Financial Technology, a non-profit that focuses on lowering the costs of healthcare and using technology like block chain, robotic process automation, and artificial intelligence to improve the quality and delivery of healthcare. St. Clair’s presentation “Blockchain: Separating Hype from Opportunity,” centered on how blockchain technology can be used in the handling of health care documentation and information. Robert Cummings, executive director of academic innovation and associate professor of writing and rhetoric, noted, “Jim St. Clair will be promoting the use of blockchain technology for the secure sharing of health care documentation. The technology presents interesting affordances around security and authentication, which have received a lot of attention as applied to cryptocurrencies.” St. Clair’s presentation was sponsored by Digital Media Studies.